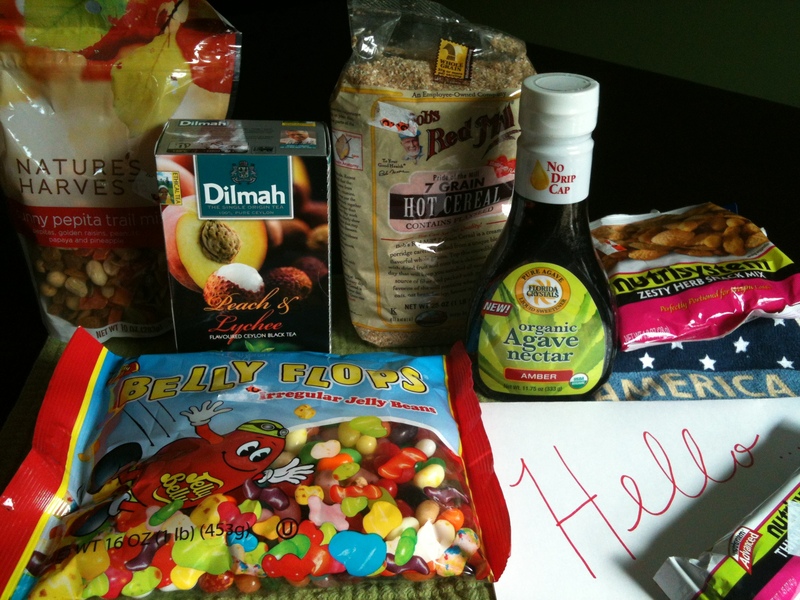 A while back I saw a post on Twitter for Foodie Penpals. I love food and love writing, so I thought it sounded good. It’s pretty simple. You get sent a name and email address, contact that person for their address and other information (allergies, etc.) and then mail them a food package. The person who sends you a package is a totally different person. The person who sent me a package was Tayla, who blogs over at She’ll Be Free. Tayla is very talented and quite lovely. And like me, she has struggled with her weight. Unlike my struggles with overeating, Tayla was diagnosed anorexia and is on her way to recovery. I’ll admit, I was a little nervous about what Tayla would send me. 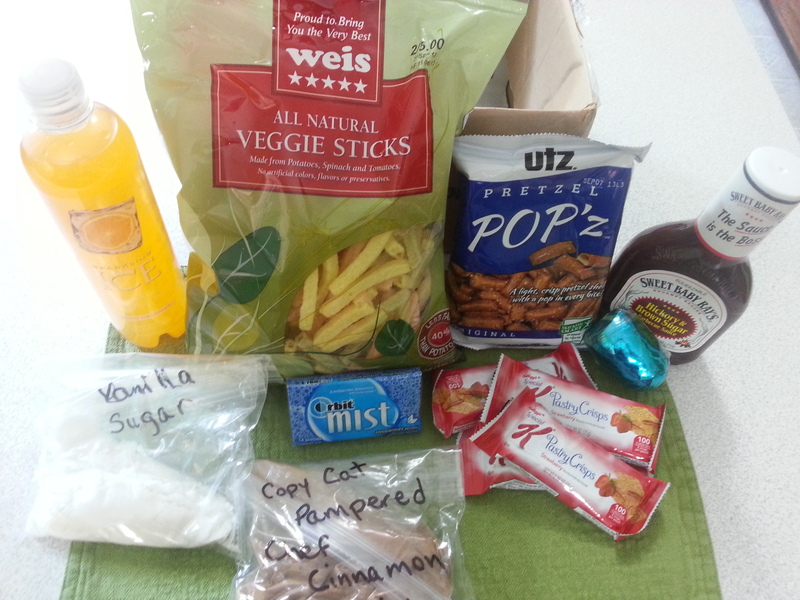 Not everything is “Weight Watchers friendly” but it’s all fantastic and I can’t wait to try everything. 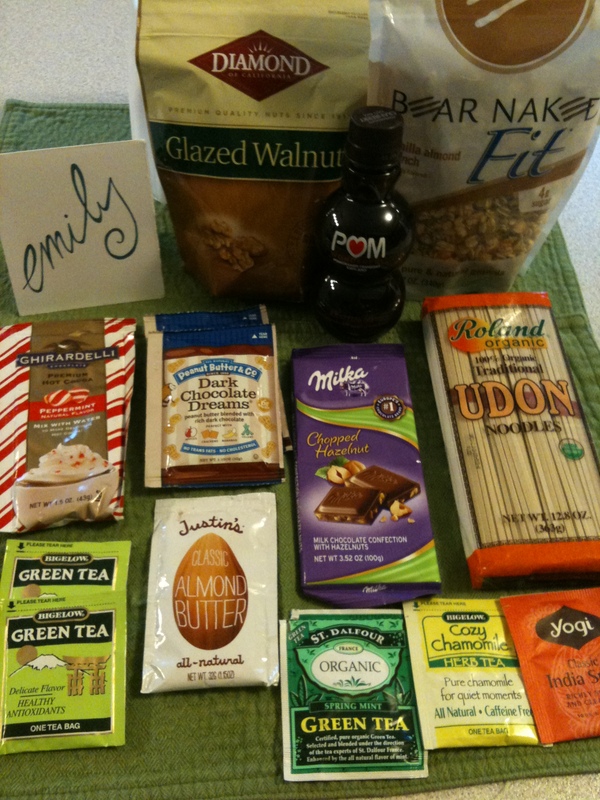 Individually – Diamond glazed walnuts, Bear Naked Fit granola, POM juice, Ghirardelli peppermint hot chocolate, Peanut Butter & Co. Dark Chocolate Dreams, Milka chopped hazelnut chocolate, Roland udon noodles, Justin’s classic almond butter, and a few different teas. I’m not a walnut person, but apparently shellacking them with sugar makes them delicious! I had to give the bag to my hubs so I wouldn’t eat the whole thing! The granola is perfect for topping off my yogurt and the POM juice is great mixed with seltzer. The Milka chocolate was yummy! I had a couple pieces and when I came home the next day saw the wrapper in the trash so I guess my husband liked it too! I’d never had almond butter – always wanted to try it but didn’t want to buy a whole jar in case I didn’t like it, so the packet was perfect. And yes, it was as delicious as I thought it would be! I’ll definitely buy more of this. I liked the peanut butter and chocolate mix. It was a little high in points so I’ll probably stick with mixing peanut butter and nutella. It sure was delicious, though! Now the udon noodles. I’ve wanted to try them but have no idea what to do with them. So, who has a recipe for me? Curious what I sent my penpal? Vegan deliciousness! I was matched up to Jamie, a workout enthusiast and vegan. I was going to find a yummy recipe and then send the ingredients needed, but I had a little trouble finding everything. 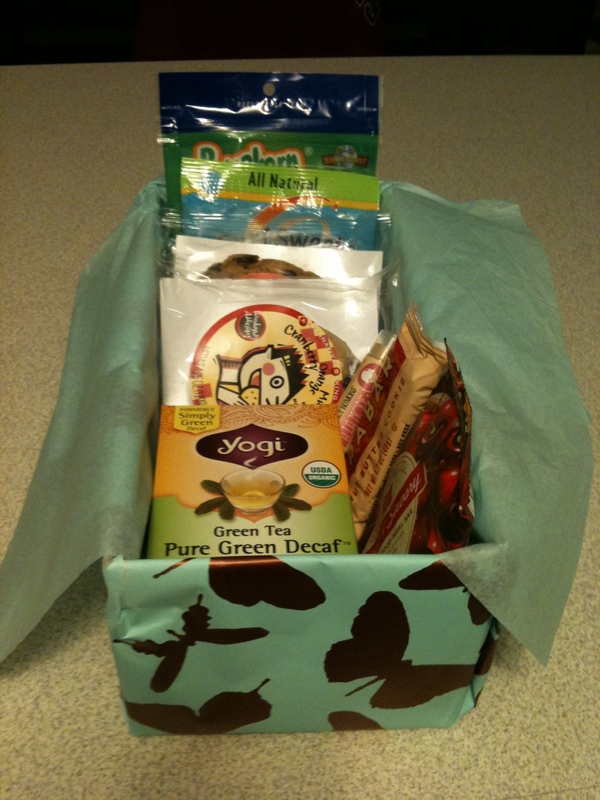 Instead, I put together a package of vegan treats that I found at the organic market. So what did Jamie think? Let’s go to her blog, Fit Approach, and find out!